Krishnanattam is a temple art of Kerala India. It is based on dance drama and presents the story of Krishna in a series of eight plays. In Krishnanattam artists focuses on bodily gestures and expressions instead of narrating the story. Krishnanattam is based on Krishnagiti (1654 AD) written by Manaveda, Zamorin of Calicut. It is believed that the Zamorin had a vision of Krishna who gave the chieftain a peacock feather, which became the living symbol of this dance-drama. Krishnanattam players wore a peacock feather and thus commemorated the vision of the chieftain. 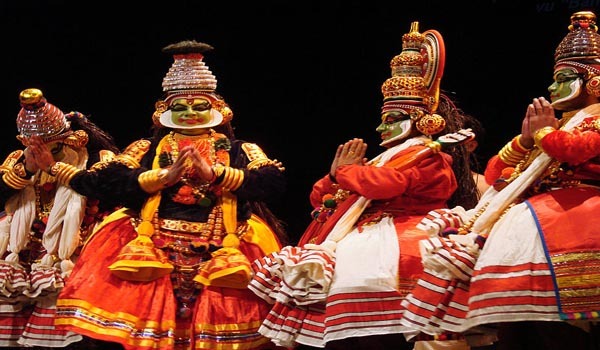 The Krishnanattam makes use of colourful masks for evil characters. The mask usage is derived from folk rituals such as ‘Thirayattam’ and ‘Theyyam‘ which is found in North Kerala. In Krishnanattam the actor does not narrate but gives attention to abhinayam (bodily gestures and expressions) and angya (hand gestures). Another artist does singing and thus there is a blend of sounds and sight. Krishnanattam consist of eight plays that are: Avataram, Kaliyamardanam, Rasakrida, Kamsavadham, Swayamvaram, Banayuddham, Vividavadham and Swargarohanam. It survives in its glory at the Guruvayur Sri Krishna temple.Edakka, a soft and small drum, capable of deep resonance, Maddhalam and cymbals , Gong, and Shankh (conch) and Thoppimaddalam are used in Krishnanattam.